With spring time right around the corner, many homeowners are interested in spending more time outside, enjoying the fresh air. For some homeowners, enjoying the spring and summer entails putting the chairs on their deck and lounging in the sun. If you’ve been considering installing a deck on your home to help you enjoy the warm weather ahead but you’re not sure if it’s worth the investment, take a look at our blog to learn about the benefits of installing a new deck. If you’ve been looking for a space where you can enjoy the warm weather with friends and family, a deck is just what you need! From family get-togethers, to graduation parties, to summer BBQ’s, a deck is the perfect place to entertain during the spring and summer months! If you’ve been looking for a way to increase your home’s value, installing a deck can be a fantastic option. Generally, deck installations offer between a 70-80% return on your investment, meaning if you sell your home within a few years, you’ll have completely recouped the cost between the resale value and time you were able to spend enjoying the space. Additionally, a brand new deck looks fantastic and indicates to potential buyers that you are focused on the upkeep and appearance of your home. You can choose to install a natural, wooden material, or you can install composite deck boards in any color to match your home’s exterior. 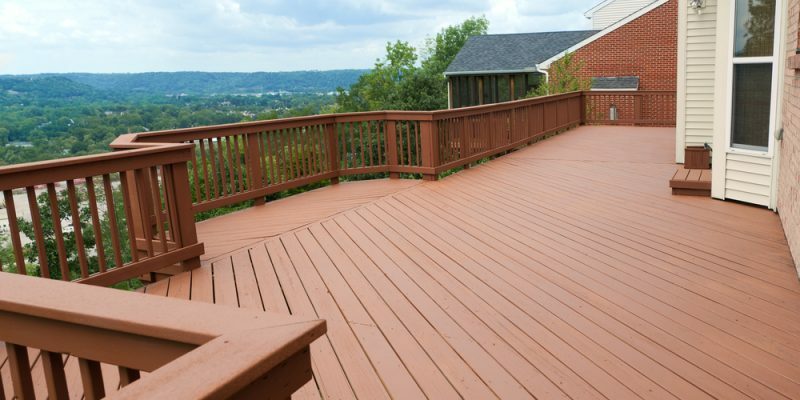 No matter what materials you decide to use, installing a deck will increase your home’s curb appeal and value! Another benefit of installing a deck is a quick installation time. If you’ve wanted to install a deck on your home but you’re worried about all of the noise that comes with constructing anything new on your home, a deck won’t be nearly as loud or never ending as other home improvement projects, such as building an addition or remodeling your home’s interior. With an installation time of roughly two weeks for the largest decks, it won’t take long to complete your deck installation project! Installing a deck can help free up storage space that was being used by your outdoor furniture, plant pots, or even things like your bicycles. Adding a deck is an easy way to create outdoor storage space that looks great and give’s your unused furniture a home besides your shed or garage. Compared to most exterior remodeling projects, installing a deck is relatively cheap. It can be an inexpensive way to add value to your home, with a cost that’s comparable to a low-end vinyl siding project. If you are interested in installing a deck on your home this spring, reach out to our team at (781) 893-4546 or by filling out our online contact form! We look forward to assisting you with your deck installation or exterior remodeling needs!